Are you working towards a Duke of Edinburgh Award? Would you like to learn new skills, enjoy the great outdoors and help support wildlife while clocking up voluntary hours towards your award? 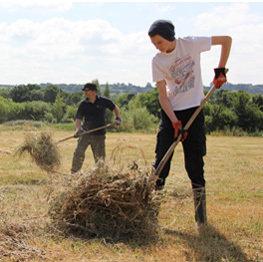 Here at Carymoor you can get involved in all kinds of voluntary work tailored to your interests, from conservation tasks such as hay raking in our meadows to helping to run our educational activities for school groups.